As a former bike shop employee/manager, I’m going to let you in on a secret. You’re definitely NOT the first, and/or only customer to use the phrase, “I don’t want to look like I’m Lance Armstrong!” Over the years, the use of that disclaimer has been unbelievably grating for an increasing variety of reasons. While it’s been applied to many different elements within bike retail, it’s most prevalent during the selection of a helmet. Problem is, back in the day there wasn’t much to sell a customer that wanted to shield their dome that didn’t look like some derivation, or trickle-down from a race-ready Tour Boy special. Now there is. 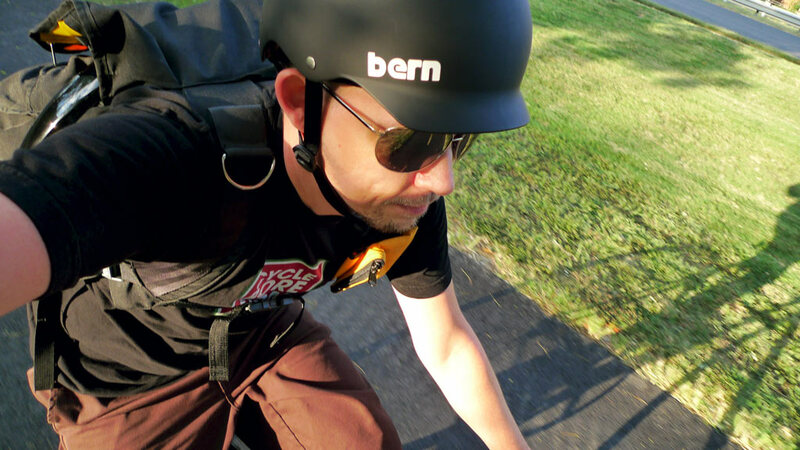 I’ve been riding the Bern Watts and Brentwood helmets for the past year and I love them. While they’re multi-purpose usage includes skateboarding and other extreme sports, they don’t look like repurposed park helmets. Bern has a unique style of their own that screams, “I am not a shaved-leg Euro wannabe!”, even if someone like myself is said wannabe. They effortlessly cover the style gamut from smug urban hipster, to mom carting the kids to the park. When I first got a look at Bern, I was drawn to the Watts. Visually it’s a “**** off” to the rest of the industry. I hate using the term counter-culture, but it definitely flies in the face of helmet design convention. Add in the color assortments, and you complete the anti-establishment package. 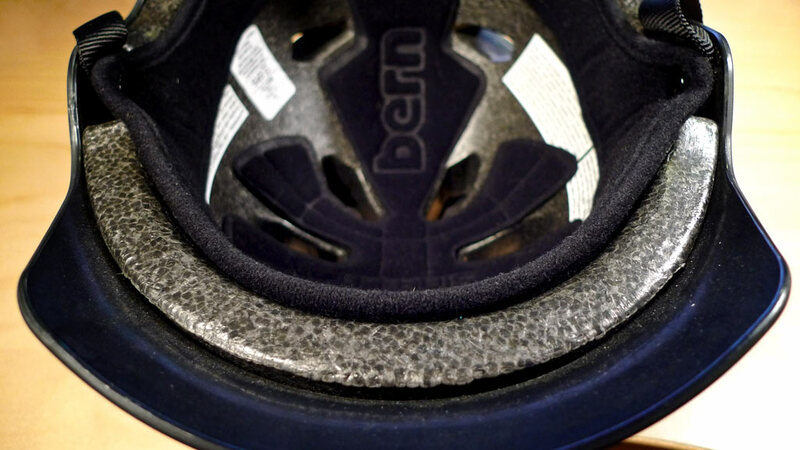 The Watts uses Bern’s EPS foam for protection. It’s a bit thicker and heftier than their Zip-Mold technology, but offers the same CPSC certified protection. It should be noted that your normal sizing may not apply for this helmet. I’m squeezing into a Large Watts that now has perfectly molded to my head. When I first got it, I swore it was the wrong size. Definitely try these on before purchasing. It has decent airflow, but not a ton. If you’re used to traditional cycling helmets, especially high-end versions, this will feel a little asphyxiating. Yet those buying a helmet for the first time won’t have a point of reference, so it won’t matter. Besides, you’re buying this in part for the style, so some sacrifice has to be made in order to look good! 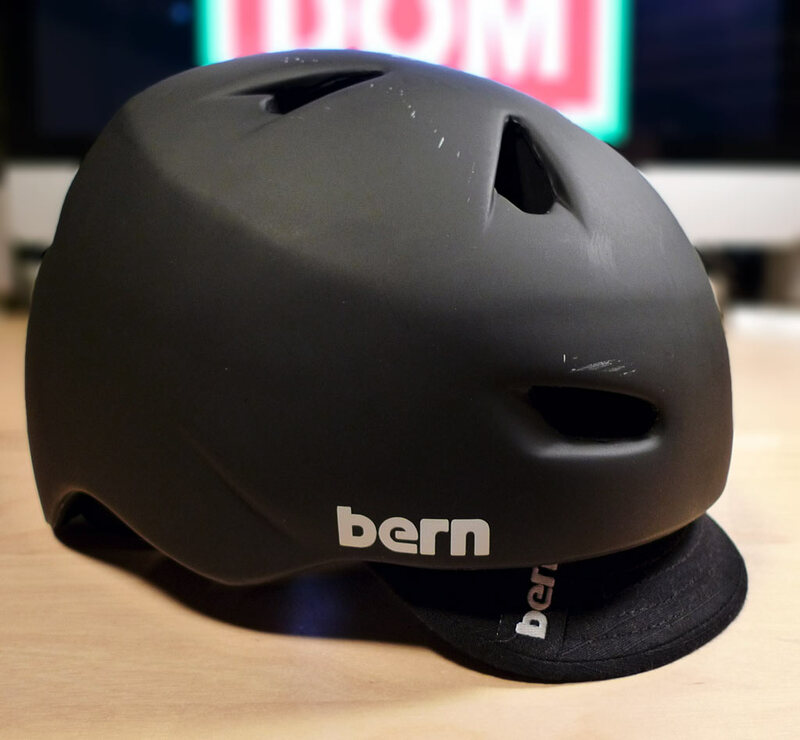 I was lucky enough to receive two different helmets to test, which distinctly highlights two of Bern’s molding technologies. The Brentwood uses the thinner and lightweight liquid injected Zip-Mold technology. I have a ton of room in this helmet—enough so to get winter hats on underneath. Speaking of hats underneath, the signature element of the Brentwood is its genius snap-in visor. It provides moderate sweat absorption, but for the most part it’s the stylistic addition. It’s this extra bit that separates these helmets from the rest of the repurposed skate/bmx models out there. The snap-in tech also allows for other accessories like the winter kit, but I’ve yet to acquire the fuzzy plaid earwarmers for test. When the weather’s hot-n-humid here in the Mid-Atlantic, the Brentwood is the model I reach for. It has more airflow than the Watts while the addition of the visor helps keep sweat from out of you eyes. The only thing that seemed like an afterthought was the rear retention system. While it’s needed, and the pad helps place the helmet correctly, it definitely doesn’t match the functionality of traditional cycling helmets. More often than not I find myself having to put the connectors back together when I make an adjustment. It’s an easy task, but one that I’m not accustomed to. On the flip side, the interior vertical adjustments of the retention is great. 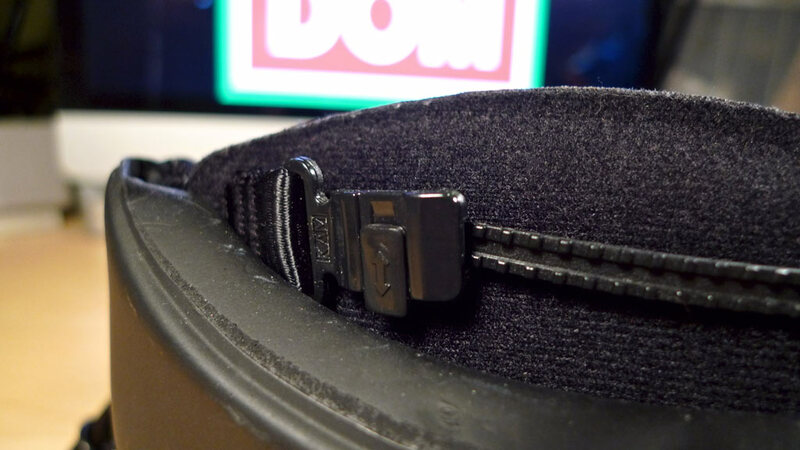 It allows for a wide range of positioning of the pad on the rear of the head. 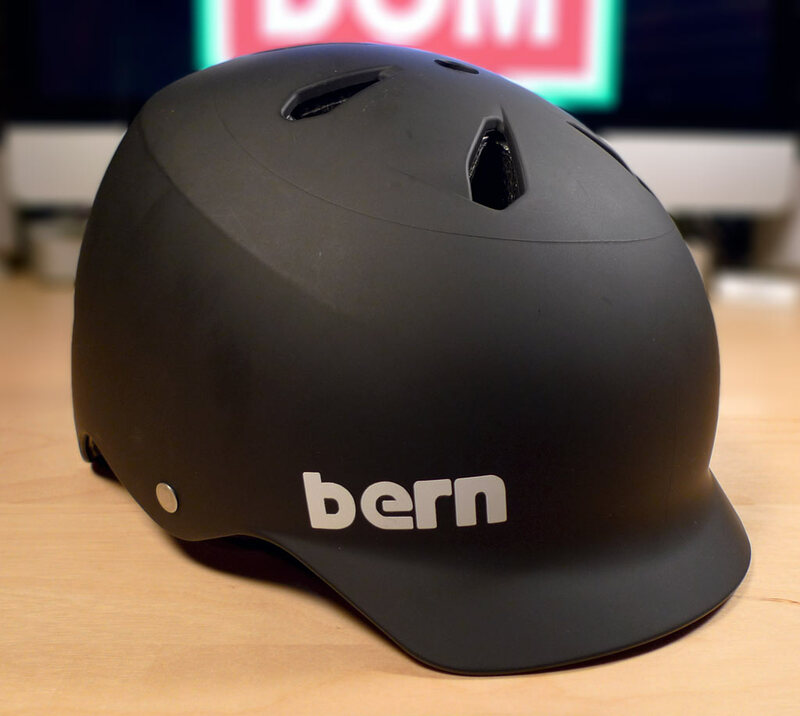 If you want something that protects your head while not branding you as a wannabe LA, then Bern is your answer. 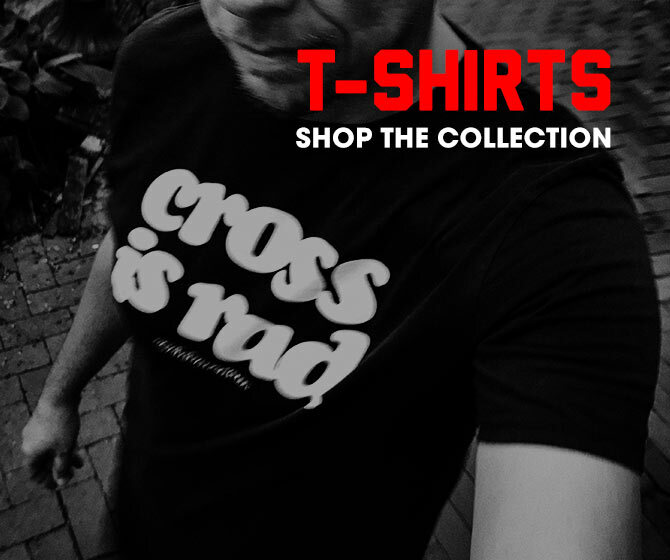 With a distinct street-edge styling they stand out in a crowd of mediocrity. I didn’t touch on it above, but they’re also reasonably priced. Both hover around the $50 price point depending on styles. They definitely need to beef up the retention system. I tend not to touch it for fear of it becoming disconnected. Not a huge deal, but one that needs to be rectified. I’d also like to see some more airflow for the Brentwood. Bern has a model called the G2 that has a little more airflow, but I’m not a fan of the styling. Once again, not a huge deal. For the record, re: the main image, I most definitely do shave my legs! But even hair-farmers can strap this one on before a vigorous ride. Anyone can—that’s the beauty of their style. PRO FACTORS: Great style for anyone looking for something different. Price point is great. OPPORTUNITIES: Retention system needs some work, and it would be nice to see a little more airflow. RATING: 80% – There’s a lot to love about these helmets. A few changes and they’re perfect.